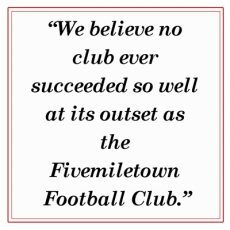 The first record of silverware won by Fivemiletown in 1933; however, it was not won on the football field but in the committee room. Local newspapers on April 6th, 1933 tell us of the Mulhern Cup Final taking place between Enniskillen GNR and Fivemiletown. The Railwaymen ran out 2-1 winners with Donnelly missing a late penalty for Fivemiletown. Two weeks later, on the 20th April, the Impartial Reporter informed its readers that Fivemiletown had protested the result on account of the fact that Enniskillen GNR played 2 unregistered players and Fermanagh & Western FA had found in Fivemiletown’s favour. The Fivemiletown team was duly awarded the cup and medals. More information on the 1932/33 season page. Taylor, Torrens, Porter, Shields, Donnelly, O’Malley, B Boyd, Moore, Montgomery, R Boyd and Fenton. 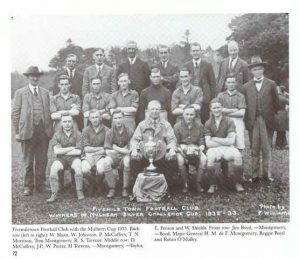 From that team, O’Malley and B Boyd were selected to play for a Fermanagh & Western team against the Amateur League (Belfast). The Belfast side came out 5-2 winners.